What is it about Italian labels that I find so endearing? More so than any other country, I find myself gravitating toward bottles with passports stamped from Italia when purchasing randomly in wine shops. It might be a sense of history that is communicated through the antiquated labels, or maybe the simplicity of the artwork, but there is a definite impulse in me to spring for their bottles. It happened last week when I picked up a half-bottle of 2009 Moscato d’Asti from G.D. Vajra for a liquid dessert. The simple crest, flowers, and font converged, creating a must-have scenario. 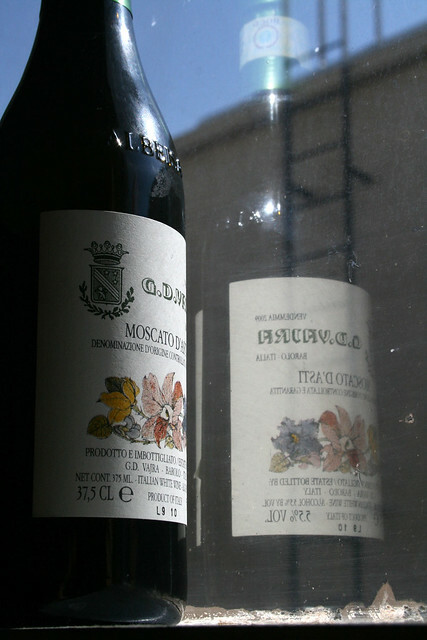 I was lucky enough to have had experience with the Piemonte producer, so the purchase wasn’t totally uninsured. After dinner, I uncorked the bottle and readied myself for the sweet experience of the aromatic varietal. This Moscato came across differently from so many others, revealing spearmint overtones from the more common flower petals but once past those lifted fragrances there were apples submerged in a mineral bath. In the mouth, the wine’s texture was richer (almost medium in fullness) than I was expecting, leaving my taste buds soaked in the flavors of sweet pear tart with spearmint garnish. The acidity (medium+) helped present a balanced hand when delivering those tasty flavors. G.D. Vajra’s Moscato d’Asti slaked my sweet tooth but at the end of the 375ml bottle I was not any closer to figuring out my attraction to Italian labels. If only all my label-inclined purchases could end so sweetly, then I might have a surefire thesis on my hands. For now, I will leave it a flavorful mystery.